Dubai: The UAE's developers and contractors may struggle to tap the bond market until a glut of homes that's weighing on prices is sold off. Arabtec Holding, the country's biggest construction company, mall-developer Majid Al Futtaim Group and Abu Dhabi's Tourism Development and Investment Co. were forced to delay plans to issue bonds. The country's non-real estate companies raised about $9 billion (Dh33 billion) from debt sales as yields on Gulf bonds slid to a record 4.55 per cent, the HSBC/Nasdaq Dubai GCC Conventional US Dollar Bond Index shows. The rate on Emaar Properties PJSC's 7.5 per cent bond due 2015 rose to 7.16 per cent last Friday, the highest since April. "A lot of lenders to UAE property companies got badly burnt in the past and they don't have much appetite," said Gus Chehayeb, a Dubai-based associate director at investment bank Exotix Ltd. "Real estate assets on a lot of developers' books also don't seem attractive or liquid at this point." Home values slump: Property markets in the UAE have been hurt more than other parts of the Middle East by the global credit crisis. Since September 2008, home values in Dubai slumped more than 60 per cent and prices in Abu Dhabi dropped by half as banks curbed mortgage lending and speculators fled. "The market is oversupplied and property transactions are still down significantly from their peak levels," Chehayeb said. "Prices probably have more room to soften. "House prices in the UAE may drop by an additional 25 to 30 per cent as population growth stagnates and more properties are built, analyst Saud Masud at Dubai investment bank Rasmala predicted in March. Dubai's home prices are expected to decline further as 54,000 homes, or about 15 to 20 per cent of the existing supply, comes onto the market from 2011 to 2015, Jones Lang LaSalle estimates. Forty per cent of Dubai properties are already vacant. About 50,000 homes in Abu Dhabi, 27 per cent of the current supply, will be completed by 2014, Jones Lang estimates. About 16,000 of those will be ready this year. Emaar has been the only major company in the industry to proceed with a debt sale this year, raising $500 million in Islamic bonds in January. The rate on the developer's 8.5 per cent sukuk maturing in August 2016 jumped 39 basis points to 7.42 per cent this month. 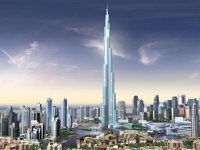 Work in progress: "Emaar has a diversified portfolio in Egypt, Turkey and India and a lot of its revenue comes from fully developed properties such as the Dubai Mall and Burj Khalifa," said Nick Stadtmiller, a fixed-income analyst at Emirates NBD. "The picture is quite different when you start talking about contractors or developers, where a lot of the assets are still in the pipeline." Dubai-based Arabtec, which doesn't have a bond, in January announced plans to raise $150 million by selling convertible debt and shares. Two months later, it delayed the transaction "until market conditions become more favourable". It's yet to announce a new date. Arabtec shares have tumbled 13 per cent this year, compared to an 11 per cent decline in Dubai's benchmark stock index.